Put down those Honey Smacks, and don't let the inviting frog and his whimsical sideways hat give you any ideas about the sugary cereal you're about to eat. The Centers for Disease Control and Prevention (CDC) issued an alert on Tuesday, advising anyone and everyone -- this means you, if you're reading this -- to steer clear of the Kellogg's cereal, due to a salmonella outbreak. The first case of Honey Smacks-induced sickness was reported in March, and Kellogg's instituted a recall of the cereal in June. So far, the number of people sickened by the outbreak stands at "130 cases from 36 states," per the CDC's own findings. The tally of those sickened keeps increasing, though, because a number of tainted boxes remain on store shelves. 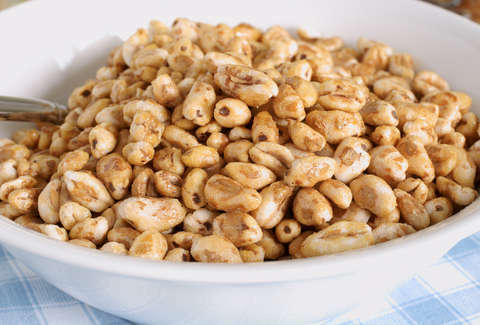 To date, 34 people have been hospitalized after eating Honey Smacks. "If you store cereal that looks like Kellogg’s Honey Smacks in a container without the packaging and don’t remember the brand or type, throw it away. Kellogg’s Honey Smacks is an oval-shaped, sweetened puffed wheat cereal with a golden brown color," the agency said in an advisory. The recall is part of a larger spate of food-borne illness outbreaks that have cropped up this summer. McDonald's salads containing a parasite prompted alarm in the Midwest, while an Ohio Chipotle was temporarily shutdown after 600 of its customers reportedly fell ill after dining there. Kroger's and Trader Joe's grappled with an intestinal parasite affecting its salads and wraps, too. If you happen to see Honey Smacks for sale anywhere, the CDC urges you to submit a complaint to the FDA Consumer Complaint Coordinator in your state. Also, there's always the possibility of eating something else for breakfast, like salmonella-free Pop-Tarts, or something.